Colombia ETF - A Return to Supercharged Frontier Market Returns? The Colombia Stock Market can now be harnessed through an ETF looking to capitalize on the emerging market trends and the prospect of Colombia business exports continuing to improve. The The Global X/InterBolsa FTSE Colombia 20 ETF (Colombia ETF Ticker GXG). Until now, if you wanted to own any Colombia stock, your sole option was Banco de Colombia (CIB, which I covered in 2008), which as evidenced below, showed phenomenal growth over the past few years. 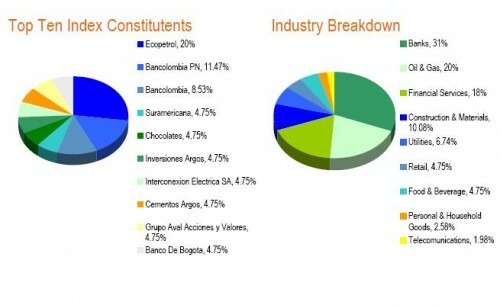 If this major Colombian bank is a proxy for how the Colombia ETF might fair based on the broader economy, look out! The shares of Banco de Colombia are at a 2000% gain (and peaked at 3500%) from the late 2001 period compared to a loss for the S&P500. A more recent US ADR was Ecopetrol (EC), but it was listed just recently and missed the party. Heavy in Financials and Energy stocks based on Fact Sheet – see below. We just had some flowers delivered the other day and the tag said, “from Colombia”. Granted, they’re not exporting high-tech gadgets and IP at this point, but this is where Mexico, India, China and other emerging market nations that had nice stock market runs began – and they have the natural resources to sustain the economy during downturns. While the Colombia Free Trade deal they were seeking was sunk due to protectionist fear-mongering and vote-seeking actions from politicians recently, the economy is much improved, the drug cartel/FARC problems are much diminished compared to when Uribe first took over and finally, if you believe the global economy is set to rebound, Colombia may be a decent place for a small portion of your international portfolio. Disclosure: No position in any of the aforementioned ADRs/ETFs. How to Invest in Cuba – Does Obama’s Cuba Deal Spell Gains?